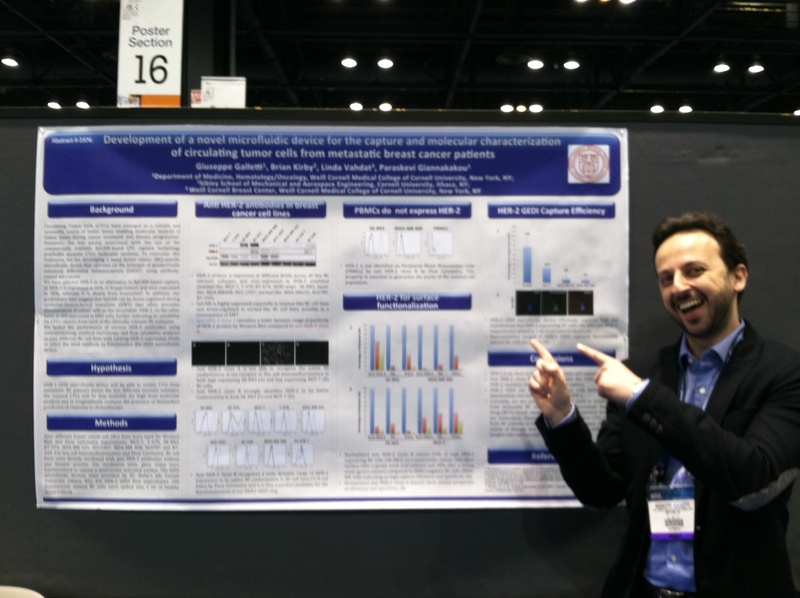 Dr. Giuseppe Galletti of The Giannakakou Lab at Weill Cornell presented at the recent American Association for Cancer Research (AACR) meeting on the development of a novel microfluidic device for the capture and molecular characterization of circulating tumor cells from metastatic breast cancer patients. Dr. Galletti works with Dr. Giannakakou in developing technology to understand how circulating tumor cells can be used give us real time information on the molecular makeup of a tumor. His goal is to be able to do a “liquid biopsy” to understand how breast cancer tumors change over time. Click here to read the presentation’s abstract. The Breast Center has an ongoing collaboration with The Giannakakou Lab.